What would Christmas in America be without cookies? There would be no snack for Santa, no visions of sugar plums for the children and no edible decorations for the tree. Christmas it seems was, above all other holidays, invented with cookies in mind. Originally cookies were largely hand formed. But by the mid-1800s, cheap, elaborately decorated tin and copper cookie cutters were being imported to this country from Germany. These cutters, often shaped as stylized Christmas images, were designed not only for making cookies to eat, but also for ornaments for the tree. The widespread availability of these utensils significantly increased the popularity of Christmas cookies, and recipes began to appear in cookbooks showing how to use them. There is probably no better known holiday cookie tradition than that described in the poem The Night Before Christmas, written by an Episcopal minister named Clement Clarke Moore. Until it’s publication in 1822, leaving a Christmas Eve treat for the “Jolly Old Elf” was unheard of. During the Depression of the1930s, naughty children began leaving cookies and milk out for Santa in hopes that in exchange for the “bribe” he would leave a gift. Children who were good left the snack out as a token of their thanks. Americans consume over two billion cookies a year, or about 300 for each person. How many of these are eaten during the Christmas holidays is not know. What is known is that Americans have enjoyed these delightful confections for over four-thousand years. This year, why not celebrate the wonders of the season by starting your own cookie tradition. With that thought in mind, may we present GrubAmericana’s classic Twelve Days of Christmas Cookies. Sugar Cookies, are also called Amish sugar cookies or Nazareth sugar cookies. This classic cookie was created by the Germans who settled near Nazareth, Pennsylvania in the mid-eighteenth century. In 2001, it was adapted as that state’s cookie. Spritz Cookies, also known as Swedish Butter cookies, originated in Germany and Scandinavia. The delicious vanilla flavor and rich buttery texture of this pressed cookie makes it one of the world’s most popular. Christmas Citrus Squares. This modern take on the clasic seasonal bar consists of layers of delicate crust, red current jam, and a wonderful Clementine flavored custard. Jello Pastels are a colorful, quick, and easy-to-make cookie that’s sure to be a big hit as a holiday gift, party treat, or just a family snack. So popular that you might think about making a double batch. Chocolate Covered Snow Peaks. These easy-to-make chocolate dipped meringues are a favorite of Food Network’s Tyler Florence and will be one of yours, too. Why not let the children help with these? Candy Cane Cookies. The whole family will have fun making these fun decorative cookies to hang on the tree, or just to enjoy them with a warm cup of cocoa while relaxing next by the fireplace. Chocolate Bliss Macadamia Cookies. If your family and friends enjoy the heavenly flavor of chocolate and nuts, this is the cookie for them. Stained Glass Stars. As beautiful as they are good to eat, these cut-out cookies are sure to astound both family and friends alike. Swedish Christmas Cookies. This buttery ice-box cookie has the lemon-cardamom flavors also enjoyed by the Norwegians. A true European classic. Paradise Macaroons. These cookies are gluten free, yet unbelievably scrumptious—so sweet and moist. A double batch of these may be the order of the day. Cinnamon Stars are a classic German gluten-free cookie that is sort of a cross between a macaroon and a meringue, with a hint of spiciness. Hanukka Cookie is included in recognition of our friends of the Jewish faith. This rich butter and cream cheese cookie can be rolled out, cut into holiday shapes, and decorated in any number of ways. Hanukkah (or Chanukah), also known as the Festival of Lights, is celebrated this year from December 8 – 16. Hanukkah is observed by the lighting of the Menorah, one candle each night of the holiday. There you have it–a baker’s dozen of some of our favorite Christmas cookie recipes. So happy baking, and may this season bring you and yours everything on your holiday gift list and much, much more. Whether you call it pop, soda, soda pop, or coke (a generic term), the soft drink industry in this country is huge–more than 50,000-gallons-per-American-per-year huge! By the late nineteenth century, bottled soda had come of age in America with over five hundred bottling plants producing some 260 million bottles of soda a year. In 1888, Dr Pepper, invented three years earlier in Waco, Texas, became the first cola sold in bottles, followed five years later by Coca-Cola. Over the next four decades, vast improvements and dramatic innovations were made in packaging and bottling including the introduction of the canned soft drink. Also, this period saw the introduction of many new brands and exciting flavors, many of which are still with us today–Pepsi, Dad’s Root Beer, 7Up, Canada Dry, Orange Crush, RC, and Big Red to name just a few. In 1925, Benjamin Tyndle Fooks, a Camden, Arkansas service station owner, borrowed four-thousand dollars and purchased a small soft drink bottling plant on the town’s main street. The early years of his new company were ones of experimentation, especially in flavor development. Although sometimes a struggle, the business was successful and two years later Fooks (pronounced like “folks”) bought a second bottling plant in Arkadelphia, about sixty miles from Camden. In early 1928, a third plant was purchased in nearby Hope, Arkansas. Unfortunately, the stock market crash in the fall of 1929, and the depression that followed, brought on tough times, and Fooks found it necessary to do much of the work himself in order to keep his plants open–mixing and bottling soft drinks, driving delivery trucks, even making peanut patties and coconut brittle to supplement sales. As business conditions worsened, Tyndle was forced to sell the Arkadelphia building, close the one in Hope, and began selling “Fooks Flavors” from his car to other bottling plants throughout Arkansas, Louisiana, and east Texas. After each trip, he would return to Camden and produced the flavors he had sold. Over the next few years, Fooks became known throughout the United States for his high-quality flavor concentrates, and by 1936, he had established the B. T. Fooks Manufacturing Company to market his line of flavors. Through the sales of his “Fooks Flavors,” it became evident that grape flavored drinks were by far the most popular. It also became clear that in spite of its popularity, there were very few grape sodas on the market. This knowledge prompted Fooks to begin searching for a formula that would produce a soft drink flavor that tasted of fresh grape juice. After two years of intense and constant experimentation, and several grape flavors later, the taste that was to become Grapette was finally developed. At the same time Fooks was developing his “just right” grape flavor, he also began searching for a name for his soft drink. In 1939, Fooks learned that Rube Goldstein, an existing flavor concentrate customer in Chicago, had trademarked the names “Grapette,” “Lemonette,” and “Orangette,” but never used them. So in March of 1940, Tyndle purchased all three trademarks for five-hundred dollars, and Grapette was born. The soft drink , with its “Thirsty or Not,” slogan was an immediate success. First and foremost, consumers loved the unique, refreshing grape taste. Another reason for its popularity was the innovative clear, six-ounce bottle that allowed the purple grape color to be seen through the glass. And because Grapette’s bottle was smaller and thinner, it chilled faster than other soft drinks and more bottles would fit into refrigerators and coolers. 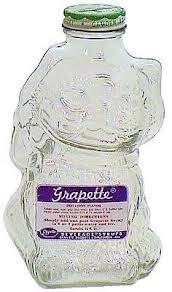 Bottlers also liked Grapette’s bottle because it used less glass to produce and therefore was less expensive to purchase. The smaller size allowed thirty bottles to fit into a smaller case–actually three inches shorter than the competitor’s case of twenty-four. The case also weighed ten pounds less when full, so bottlers were able to use lighter delivery trucks than other brands–all important savings. In 1942, prior to the second World War, wealthy oil man R. Paul May acquired the international rights to Grapette in order to develop a Latin America market for the new grape soda providing the fast growing company a presence outside the United States. 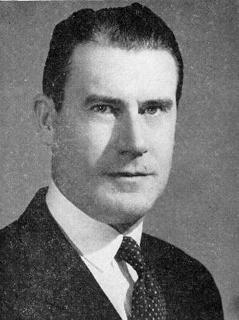 May sold his first franchise in Guatemala City in 1945, quickly followed by other Latin American cities. After the war, the company’s name was changed from B. T. Fooks Manufacturing to The Grapette Company, and with the change, sales continued to spiral upward. In 1946, the company added Lemonette to its product line, and the next year, Orangette. Both of these successful new flavors were “true-flavor” soft drinks containing large amounts of real fruit juice. By 1948, The Grapette Company had added two additional product lines, The Botl-O and Sunburst, each having fourteen flavors. Also in 1948, the company introduced another industry first–its famous “Animal” syrups. These eight-ounce kitten shaped glass containers were filled with fruit flavors that could be mixed with water to produce a gallon of economical non-carbonated drink for just thirty-three cents. As an added bonus, the screw-on lids of these whimsical bottles were slotted so when empty the cap’s cardboard liner could be removed and the container used as a child’s bank. While demand for Grapette’s animal syrups proved to be extremely successful, the manual labor involved in filling, labeling, and sealing the irregular shaped bottles proved too slow and costly, so the search for a replacement was began. By 1953, the elephant bottle/bank was introduced enabling production to increase to more than 10,000 cases a day. 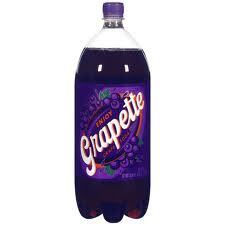 Just ten short years after its introduction, Grapette had risen to become the most popular grape flavored beverage in the nation and the seventh largest soft drink company in the industry. 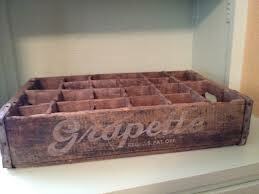 In its peak years, Grapette was produced by more than 600 bottlers in thirty-eight states. In 1972, Fooks sold The Grapette Company to Rheingold Corporation, marketers of beer as well as some regional soft drinks. Three years later, Pepsico began a hostile takeover of Rheingold and, in order to complete the transaction, sold Grapette to the Monarch Beverage Company who promptly shelved the product in favor of their own NuGrape brand. Fortunately, in 1962 Paul May had officially formed Grapette International as a separate entity from The Grapette Company and was not part of its sale to Rheingold. Still very popular in South America as well as Caribbean and Pacific Rim countries, Grapette International continued to successfully market its products. On the domestic front, they also began producing various private label soft drinks made from the company’s original flavor formulas. In the late 1980s, Sam Walton, founder of Walmart stores, told Brooks Rice, May’s son-in-law and then chairman of Grapette International, “I want Grapette in my stores.” And while at that time he was unable to provide Walton with the Grapette brand name, he made a pledge that one day he would fulfill the request. Finally, in early 2000, after numerous attempts to purchase back the U.S. rights to the lost trademarks, Grapette International was successful. In 2005, Grapette and Orangette once again became available exclusively at Walmart stores across the nation making it possible for consumers to once again enjoy the authentic flavor of America’s once favorite grape soda–Thirsty or Not! Americans have always been great at creating new foods. This site is dedicated to exploring some of those foods--their origin, where you can find them and recipes for preparing them in your own kitchen. We hope you'll enjoy the journey we call GrubAmericana. My Favorite Breakfast Food – Pancakes. Jell-O! The Jiggly, Wiggly American Icon. Enter your email address to receive notifications of new GrubAmericana posts by email.